www.janetcharltonshollywood.com Want more details? Visit my bio and click on link! 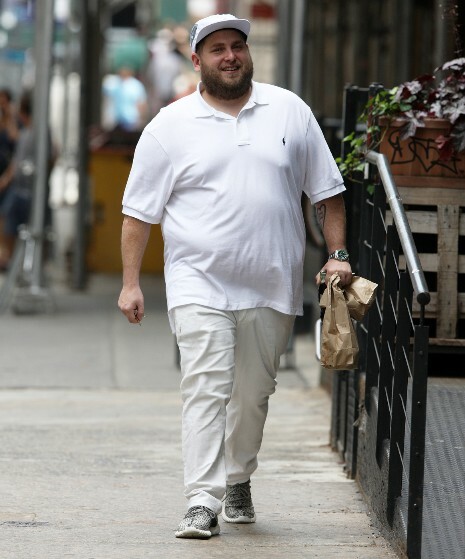 » Blog Archive » DOES JONAH HILL REALIZE HOW BIG HE IS? HE’S WEARING WHITE! We almost didn’t recognize the Moneyball actor, he’s packed on so many pounds. Jonah, 31, is in New York filming the comedy Arms and the Dudes with Miles Teller, and he’s reportedly been eating a lot of greasy deli food. He may have reached 300 pounds. Back in 2011 he lost 40 pounds with encouragement from his Moneyball costar Brad Pitt, and he looked great. Does he even own a full length mirror? Sometimes men only look at their faces in the mirror and Jonah, like many portly men, has camouflaged his chins with a beard. He’s working non-stop – has four movies coming out next year. Remember Jonah, you don’t have to be chubby to be funny. He’s Bigger than a huge matzah ball that’s for sure. Why are u trying to keep this noone relevant? big small thin fat ( there is NO CHUBBY going on here) none of it will ever change how talentless and homely this thing is. how did he ever become ‘famous’…. he is one of those people where i avoid ANY movie he is in no matter how good it may be or how many other people in it i really like….i have a lot of people like that, so off putting to me i will not watch…. Angelo would go for it! I, too, avoid movies with this dude, I just know they won’t be entertaining to me. Poor Jonah-the-whale has been known to inhale enough food to feed a family of six–and then brag about the enormous size of his resultant dumps. Silver lining: his gluttony is great for the economy! Jonah is lucky, and will never have to dodge a bullet. One of the great mysteries of the current times. Looks like he’s avoiding relationships in his life — yuck!!!!! Fat and rich don’t care.. so there!!!! This loser must be connected . Who would hire him?